I found a preview of A Darker Shade of Magic at the end of my copy of Vicious, and I was instantly captivated. Luckily, I had a copy already, so I was able to dive straight into it. Kell is an Antari, one of the last humans with the ability to travel between parallel Londons. A long time ago, traffic between the four Londons flowed freely, but that was before Black London was overcome by magic, and the other three sealed themselves off, with nothing permitted to cross their borders. Kell doesn’t really take these restrictions seriously, though, and has a healthy trade smuggling items between the worlds. But when someone gives him a letter to take across, he finds himself in a whole bunch of unanticipated trouble.. and stuck with Lila, an incorrigible thief who seems to expect him to take her on an adventure. First, the worldbuilding. 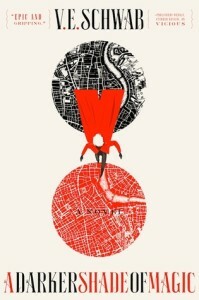 I liked the idea of the four parallel Londons, each with varying levels of magic, and they were well executed – there’s our “Grey” London, with hardly any magic, Kell’s native Red London, where people and magic are balanced, and White London, where magic is seen as something to be conquered. And Black London, which was devoured by its magic, and no one talks about anymore. The universes are all very different, aside from having a city named London at the same spot, and it was interesting to see how that worked. I also enjoyed the near-sentience of the magic itself. Just like Vicious, the book was pretty fast-paced, and the bulk of the action took place over a short period of time. While I enjoyed that things moved quickly, I really wanted to spend more time getting to know the world and characters. We get a little information via exposition (there’s a particularly clunky bit of that in the first chapter where Black London is explained) and characters musing about their past, but there’s pretty clearly an Urgent Problem To Be Solved. I guess it’s somewhat like urban fantasy – two partners trying to fix something magical (with romantic tension), but that’s not my favourite genre, especially when there’s a secondary world to explore! The characters also weren’t that great – Kell was okay, although a bit too naive and entitled sometimes. Lila was pretty irritating, though – she’s a thief who has had a rough life, and who’s been forced to murder people to survive (which is treated very casually), but she also has childlike dreams of being an adventurer and a pirate. She’s also entitled in her own way, and it was hard to sympathise with her, or understand why anyone liked her. There wasn’t a lot of character growth, either, because the book takes place across such a short period of time, so Lila at the end of the book was still as irritating. The most interesting character was the other Antari, Holland, but he wasn’t exactly a good guy, and we don’t know very much about him.